Barcode printers are used widely for printing barcode labels or tags, like label for cartons before shipment, or to label retail items. 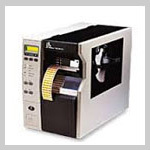 Barcode printers are of 2 types –Direct thermal transfer based printers and Thermal transfer printers. Industrial barcode printers are built to meet the demands of large warehouses and manufacturing facilities and hence have large paper capacities, operate faster and have a longer service life. While compact, desktop barcode printers are designed to suit retail and office environments. At Scan, we understand that choosing right kind of printer for your business need is essential because when it comes to barcode label printing, quality should never be compromised. We help you choose from our range of Industrial Barcode Printers, RFID Printers, Card Printers, and Receipt Printers.